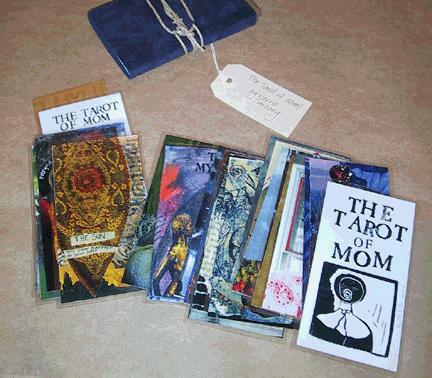 The Tarot of Mom is in the form of a deck of tarot cards. 22 cards are included in this tarot-sized deck. The Tarot of Mom is a tribute to motherly advice that I started to work on when my mother first became very sick. As she turned inward, taking more care of herself, the little child in me felt neglected. This deck is about the advice and words I wished she was giving me during this time, when of course she was focusing on getting better, not taking care of her little girl. Each card corresponds to a card in the traditional Major Arcana, and for you tarot purists, they are presented in order, starting with The Fool. The deck contains 22 cards, plus a title and colophon card, presented in a dark blue leather pouch. Cards are 2.5 x 5 inches, color photocopied, and laminated with a decorative paper backing. All the materials used are acid free. Two of the advice cards included are: The Fool- Look Before You Leap and The Myth- Don’t believe what you see. 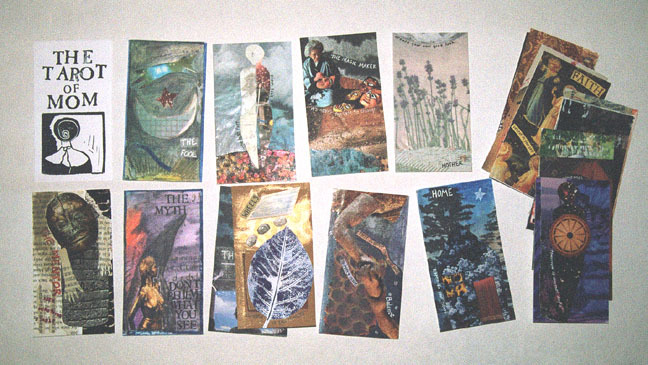 The Tarot of Mom has been shown in dog eared magazine and ARTitude Zine. If you’d like a set, let me know and we’ll work it out. The Totem Tarot is ready! Over the past few years, I’ve been very interested in animal totems and in watching and listening to what they have to tell us. Many cultures believe that an animal spirit guides us. We can be guided by different animals at different times in our lives. We can be guided by different animals at the same time, as well. This series is about listening to the animal spirits around us and learning what they have to teach us. 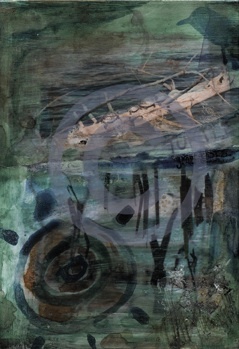 This series is now available as an art deck of cards, The Totem Tarot. Based loosely on a traditional tarot deck, The Totem Tarot is made up of 22 cards. Limited edition booster cards will be released over time, and custom cards may also be available. Each card has an inherent meaning, but it’s also up to the individual using the cards to listen to their intuition to determine what the card is attempting to convey to them. Like animal spirits appearing when they want to guide us, The Totem Tarot can also be used as a guiding force. Draw a card and meditate upon it to bring a totem’s characteristics into your life. Use a card as a reminder or visual prompt to reinforce your mission. Or, of course, you may ask the totems a question, shuffle the deck, and choose a card at random, taking your answer from the totem that is presenting itself to you. The Totem Tarot deck is made up of 22 cards. Cards are 2.75 x 3.75 inches, color printed, backed with decorative paper by hand, and laminated. The deck is presented in a paper case. The Totem Tarot is accompanied by a 24 page booklet explaining the individual totems and showing how the cards related to the traditional tarot. 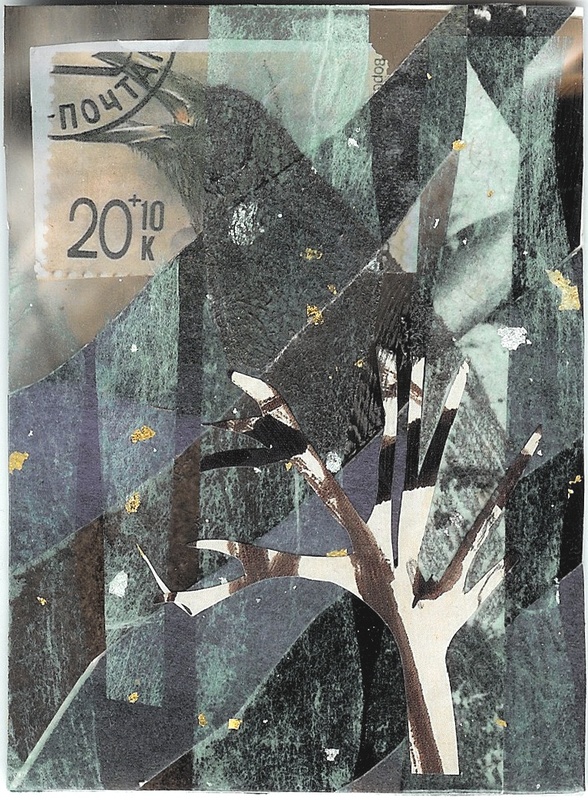 The Totem Tarot is $55, available on etsy. Individual prints of each totem are also available, and some original artworks are available for purchase too. Booster cards will be available over time. If you’re interested in a custom totem, email me. (Just so you know, The Totem Tarot contains: The Coyote, The Zebra, The Tiger, The Sea Otter, The Horse, The Wolf, The Crow, The Salmon, The Seal, The Turtle, The Bee, The Lion, The Peacock, The Heron, The Butterfly, The Painted Dog, The Hawk, The Owl, The Eagle, The Kingfisher and The Swallow. Limited edition booster cards will also be released over time, and custom cards may also be available. Each card has an inherent meaning, but it’s also up to the individual using the cards to listen to their intuition to determine what the card is attempting to convey to them. Like animal spirits appearing when they want to guide us, the totem tarot can also be used as a guiding force.